When the glass in your window breaks, it is possible to replace only the glass pane. Repairs of the glass only can even be done in most double-pane or insulated windows. 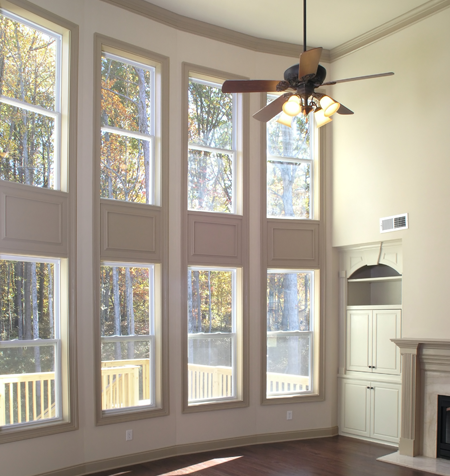 Having ARC Glass LLC replace your existing single-pane windows is a smart investment. Our technicians will install your new windows without disturbing your home's structure. In the end, your home will be enhanced by improved curb appeal. New vinyl and aluminum windows add beauty and comfort. They make your home more energy efficient, which is especially important with the steamy summers in Houston. Dual panes can also cut noise, allowing you to enjoy a restful atmosphere within your home. We proudly sell and install the highest quality vinyl and aluminum windows supplied by Don Young and Vistamark in order to give homeowners the windows they deserve. Learn more about DYC and Vistamark. 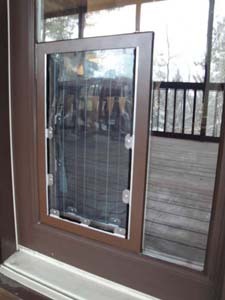 ARC Glass can install a pet door in your glass patio door. Allow your best friend ease and comfort by allowing them access to cool air in the hot summer months and warmth in the winter by installing a easy access pet door right in your glass patio door. "The guys called when they were on their way and were prompt, polite, and professional. They gave me a very fair estimate and came back the next day for the installation, which took no time at all. They did a great job and didn't leave a mess. I would recommend ARC Glass and use them again if I have the need. I was very impressed with their professionalism and courtesy." "Arc glass was prompt. They arrived the time they said they would and their price for replacing the window was more than reasonable...after getting quotes from other companies. Their quote was what was charged. They cleaned up after they finished. I am pleased."